Universal precautions has been around since 1983 (then called “Blood and Body Fluid Precautions”) and as defined by CDC, are a set of precautions designed to prevent transmission of human immunodeficiency virus (HIV), hepatitis B virus (HBV), and other bloodborne pathogens when providing first aid or health care. Under universal precautions, blood and certain body fluids of all patients are considered potentially infectious for HIV, HBV and other bloodborne pathogens. Universal precautions involve the use of protective barriers such as gloves, gowns, aprons, masks, or protective eyewear, which can reduce the risk of exposure of the health care worker’s skin or mucous membranes to potentially infective materials. In addition, under universal precautions, it is recommended that all health care workers take precautions to prevent injuries caused by needles, scalpels, and other sharp instruments or devices. Ok, this isn’t breaking news, so what’s the point of this blog? Wear gloves when starting IVs – this is NOT optional. We all know we must wear gloves… but why are there still nurses who knowingly don’t? I have personally observed two RN’s who absolutely do not wear gloves when starting IVs. These two RNs have a combined nursing experience of 65 years, very experienced, knowledgeable about universal precautions yet when asked why they don’t wear gloves when starting an IV, one response was…I just can’t feel the vein and can’t start an IV with gloves. Keep in mind that gloves are not required when assessing and looking for veins. Unless the patient’s skin is not intact, you can use your bare fingers to palpate and look for a suitable vein. Once you have found a suitable vein, cleansed the selected site with appropriate cleansing agent. 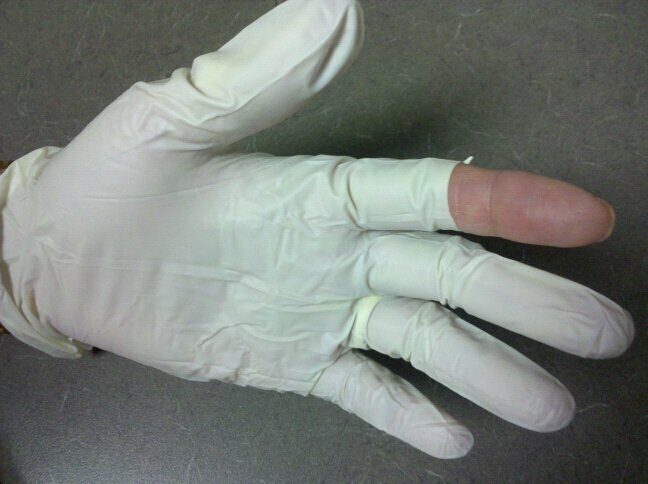 Wear gloves when ready to stick the vein and keep gloves on until venipuncture procedure is completed. Her employer has ordered larger size gloves for her, so there is no excuse not to wear gloves yet she doesn’t. DUH? I understand the issue of latex allergies – there are latex-free gloves available now – some has better touch/feel quality than others. Wears glove but with one finger cut off – NOOOO!!! Please don’t do this…. Often they cut off the glove over the finger that is used to palpate the vein while the other hand inserts the IV catheter. Remember, there is a potential for the finger to be exposed to blood and also increases the risk of getting stuck by the IV catheter. Use gloves for performing phlebotomy when the health care worker has cuts, scratches, or other breaks in his/her skin. Use gloves in situations where the health care worker judges that hand contamination with blood may occur, e.g., when performing phlebotomy on an uncooperative patient. The bottom line: It is difficult to comprehend why RN’s will deliberately not use gloves when they know that there will be exposure to blood after the venipuncture. In my opinion, there is just no excuse and not worth the risk. Good practice should prevail even with “aging”. ← Sterile Water for injection…….not for infusion! !